Zhou Yuefeng (left), Chief Marketing Officer of Huawei Wireless and Jiang Xiangzhong (right), President of Huawei SingleRAN Domain, released “Dual-200” Massive MIMO AAU at MBBF 2017. 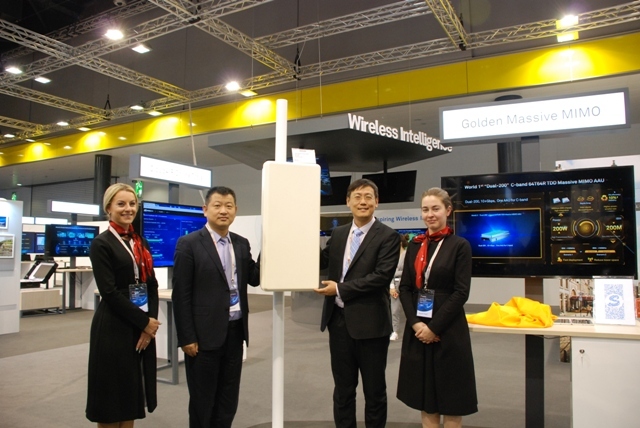 Huawei recently announced its industry-leading high power (200W) and high bandwidth (200MHz) “Dual-200” C-band Massive MIMO AAU at the 2017 Global Mobile Broadband Forum. The device can reduce the overall cost of C-band deployment and maximize existing site and spectrum resources, to significantly improve wireless network capacity and user experience. The ”Dual 200” C-band Massive MIMO AAU is designed to meet the challenge of rapid development of mobile Internet for MBB network capacity, and to build the ability to evolve towards 5G. The launch of the “Dual 200” is expected to accelerate the pace of C-band deployment worldwide. The “Dual-200” C-band Massive MIMO AAU is the latest product of the Huawei Massive MIMO series. Adopting the industry-leading power amplifier technology of Huawei’s RF chip and innovative antenna array technology, it features ultra-high power (to improve coverage), ultra-large bandwidth, and ultra-high integration. To support wider coverage, the power amplifier technology used by this type of AAU can achieve as high as 200W power, 60% higher than previous generation devices. In addition, the C-band will be the mainstream band of 5G NR, with abundant spectrum resources. Operators will generally have more than 100MHz bandwidth. This product has a capability of 200MHz bandwidth, which doubles the capability of the last generation. It will support operators’ future C-band spectrum combinations, with a single module to complete the C-band deployment. This saves site space and reduces network construction costs. This product enables the peak rate of a site to reach up to xGbps and up to 10+Gbps for 5G NR, which meets the future needs of large-capacity services. Huawei Massive MIMO products have been deployed in more than 40 countries, including Japan, China, Spain, the United Kingdom, and Saudi Arabia. At Softbank Japan, Huawei tested TDD Massive MIMO and multi-carrier aggregation using 40MHz in 3.5GHz, to realize the downlink throughput of 1.4Gbps.